Ask anyone native who has been away from Malta for a while for the top 5 things they miss about this place. Invariably, Maltese bread or ‘hobz biz-zejt’ makes the list. Trust me. I’ve just become a fan of a Facebook page called ‘Hobz biz-zejt’ that has over 2,500 fans. One of its manifestos seems to be a call for a national ‘Hobz biz-zejt’ day. The Maltese loaf is part of our heritage, a badge of pride. At a par with pastizzi. And most of us cannot get enough of it, despite resolutions to stick to brown bread in search of a healthier option. Everyone has a favourite hobz biz-zejt recipe. And stories to tell. Maltese expats regularly smuggle it out of Malta. Others try and replicate it back home. We’ve even found a picture of a crib in a Maltese loaf. For me, the Maltese bread is about walking past a baker’s early on a winter’s morning and suddenly getting intoxicated by the smell of fresh bread coming out of a wood-burning oven. It’s about childhood, picnics, a snack by the sea. You dig a hole in the soft centre and steal the warm pieces before anyone else notices. You watch the butter melt, you cut a door-stopper size and have a swig of beer and talk with your mouth full to your friends. A basket before a fenkata. A van hooting its horn at the end of the alley and you join a throng of old ladies, all wanting their own variations of what’s on offer.. ‘misjura’ or well done.. or ‘naqra nejja’ for someone who doesn’t like her bread too crusty. In its purest form, the hobz biz-zejt is at its best still warm, doused with olive oil, tomato paste and olives and capers and.. whatever else takes your fancy.. a slice of gbejna.. chunks of tuna.. some basil. Top up with salt and pepper. Eat it raw. 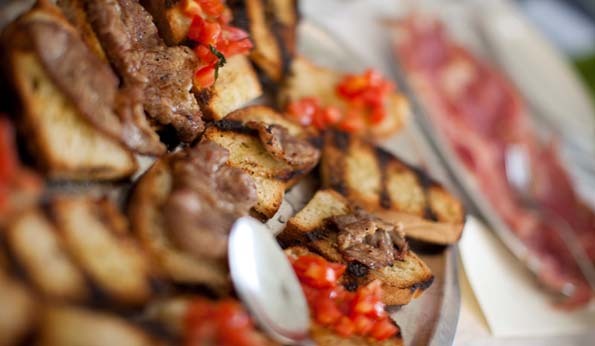 Concoct bruschetta versions like the picture. Eat it at home. Go to craftsmen like the guys at Olympic in Mosta who have multiple variations. The Maltese loaf is up there with the gods of haute cuisine. And you can tell a true Maltese by the sparkle in his eye, when the subject turns to hobz biz-zejt. And if you still cannot get enough of bread, get down to the Qormi Bread Festival that takes place 12 September and celebrates the town’s history as Malta’s chief milling and bread-making place since the time of the Knights.